that lift and transport us to new and wild places. masks make you laugh, make you jump, make you frown. You can make masks of all colors and kinds. 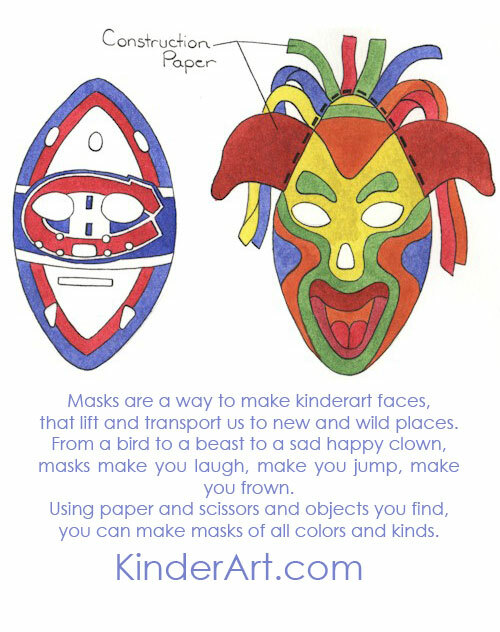 Students will see that masks have great meaning in many cultures. Students will have a chance to discover the importance of connecting our present day lives with the lives of those who lived before us. Students will create a paper mask. When making masks, take the opportunity to discuss masks from around the world. Children could even take part in a discussion about how everyone wears different “masks” from day to day… when we are sad, happy or scared. Draw an oval shape on the large piece of paper. The larger the better… masks can cover more then just the face. Cut the oval shape out of the paper. At both the top and bottom of the oval, make a 1″ cut. (You will later take these cuts, fold the paper across itself and staple so the mask has some dimension). Draw and cut out where the eye holes and mouth and nose holes (if any) are going to be. Decorate the mask by using bright crayon colors or bright paint colors. Even more details can be added with magic markers and crayons. Now, where you made you made your cuts, fold the paper and staple in place. This will give your mask more dimension. Glue found object decorations on the mask. Anything from feathers and string to beads and tissue paper. 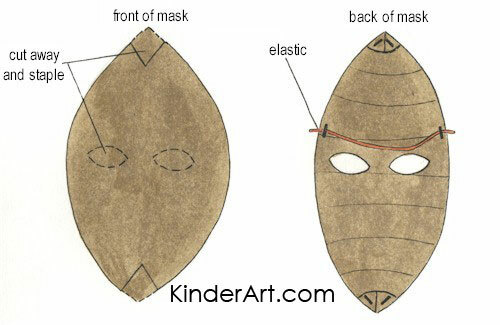 Staple string onto the mask so it can be tied around the head.